Our whole lives (or at least mine, born in the ’70s) we have been taught to be sparing with our butter, or even to substitute it with something else like lemon juice or soy sauce. But now all of a sudden I am trying out LCHF (Low Carbohydrate High Fat diet) and searching for ways to increase my butter intake. This is a weird turn of events. Of course it’s easy enough to load butter onto cooked green beans, asparagus, peas, fiddleheads, broccoli and the like. But let’s face it, these vegetables are all a little slippery and just don’t hold a lot of butter. Unfortunately the things I most strongly associate with butter eating – bread, potatoes and popcorn – are now out of my diet due to their high level of carbohydrates. Technically summer corn on the cob should be out of my diet too, but come on! Summer corn? That’s like the best thing in the world. So I’m still going to enjoy summer corn when the time comes, and I’m going to load it up with grass-fed butter and sea salt. There have always been a few vegetables where using scant butter seemed to ruin them. In particular, I am talking about boiled artichokes and mushrooms. When I used to boil artichokes, I would serve them with a sauce of butter cut with lemon juice, and then I would just barely dip each leaf in the sauce. It was an agonizing exercise in restraint. Well now it’s a different story. Now I am really slopping the artichoke leaves around in the butter to intentionally absorb as much as I can. Last night my daughter and I managed to eat 1 TBS melted butter each on our artichokes. Wow, right? Don’t you find when you cook mushrooms that they get incredibly dry? And that adding water or broth just makes them taste, well, watery? Well literally the only thing that can fix this problem is adding more butter. But until discovering LCHF, I wouldn’t dare. Now I am sautéeing 2 cups of mushrooms (about 5g carbohydrate) with at least 2 TBS grass-fed butter. If the mushrooms get dry, I just ADD MORE BUTTER! This works especially well with morel mushrooms, which are a wonderful treat in spring. Cauliflower (about 5g carbohydrate per cup) is such a versatile vegetable because it can be roasted whole, it can be boiled, it can be “riced” with a ricer, grater or food processor, or it can be mashed. If you mash it, you can add crazy amounts of butter and also cream cheese, whipping cream or sour cream. To be clear, I am talking about using grass-fed butter. I don’t really care if it is certified organic, because the process of pasture-raising cattle usually indicates that a different standard of farming is at play. Of course, organic is preferred. However I approve of Kerrygold butter from Ireland, which is not organic – nor is Smjör from Iceland. Incidentally, on the Smjör website they claim that the Icelandic people used to consume about 1700g of butter per person per week – which is about 3 3/4 pounds of butter. Let’s keep breaking that down. That’s just over 2 “sticks” of butter per person EACH DAY, or half a pound. I don’t think I could stomach it. 2 sticks of butter is equivalent to 16 TBS (that’s 1760 calories and 192g of fat!) . On a good day, I can have 2 TBS in my coffee or other hot beverage, another 2 TBS on 2 cups of vegetables, and then possibly another TBS or so in some grain-free baking or melted into a sauce. And that’s only 6 TBS of butter, still 2 TBS short of a stick! (I don’t think I’ve ever actually been able to eat that much in a day, and incidentally, that’s 660 calories and 72g of fat). There really isn’t a limit to how much butter you can consume for health – it will be how much you can stand. Butter and fat are really going to stimulate your bowels, possibly make you feel nauseous at high levels, and generally take some adjusting to. It is really, really hard to eat “too much” butter accidentally. If you want to do these same fantastic butter conversions, use this online butter calculator and knock yourself out! There are so many fats to choose from if you are attempting LCHF. I think coconut oil or Medium Chain Triglyceride oil would be the most important fat because those oils tend to coax your metabolism into ketosis or fat-burning more than any other fat. However butter is important for so many other reasons. The best reason to eat grass-fed butter is that it contains the magic trifecta of Vitamins A, D and K2 in perfect harmony. Vitamin K2 is going to help you move calcium from your soft tissues into your bones, and reverse plaque-related heart disease. Vitamin D helps the calcium to take orders from the K2, and Vitamin A again helps with the absorption of calcium. I mean, this trifecta does so much more – protects against osteoporosis, fights tooth decay, helps control cell division and gene expression, nourishes the mucous membranes, protects against cancers – but trying to figure it out in supplement form will always mean that one is out-dosing another. The best way to get your fat-soluble vitamins is from a natural, traditional food like grass-fed butter that contains all three in a golden proportion. The next best reason is that grass-fed butter is full of Conjugated Linoleic Acid (CLA). We initially get it in breast milk and we make a little bit of CLA in our gut, but the best source is kangaroo meat and pastured animal products like butter. Grass-fed ruminants can have as much as 5 times more CLA in their end products as grain-fed ruminants. CLA is concentrated in the fats of animals, so butter is especially potent. CLA has anti-tumor properties that fight all three stages of cancer – initiation, promotion and progression, in addition to being able to dampen the effects of carcinogens on cell mutations. CLA also boosts your immunity, lowers insulin resistance, builds muscle mass and reduces body fat. I would hate to skip out on butter and miss all that. Butter is also a great source of antioxidants from Vitamins A and E, and structurally insulating cholesterol which nourishes the brain. There are a million other reasons. Just google it. If you don’t want to smuggle grass-fed butter over the border into Canada, you can do everybody a favor and buy a share in a small local dairy farm. That way you can access your own grass-fed milk, cream and butter to your heart’s content, and simultaneously support local independent farmers. Go to the website realmilk.com and search around until you find your country and city. I would recommend a small farm with less than 20 Jersey or Guernsey cows because they are more likely to carry the beneficial A2 gene. Avoid Holsteins. Make some phone calls, visit the farm, take responsibility and ownership of your food supply. If you aren’t ready to trust raw milk per se, you can always buy it and boil it yourself. My point here is not to waste your time with conventional butter and dairy. Not when real food is so close at hand. So you’ve smuggled in all this grass-fed butter, now what? It’s not like you can spread it on toast, sandwiches or pancakes. Not in a dream world, anyway. (A dream world is one where you don’t eat sugar and grains, FYI. In case that wasn’t clear). So you can bake with it (almond/coconut flour to the rescue), melt it on your vegetables, add to sauces and gravies (what a great emulsifier!) but short of just eating it, you might find yourself running out of ways to answer the age-old question: How can I get more butter in my life? This sounds crazy, I know! But it’s not my idea. This comes from The Bulletproof Executive and tons of people are doing it. Don’t be the last to the party. And then I sometimes add a little raw milk to cool it down and make it creamier. If you only add coconut oil, which I sometimes do, you will get a pool of oil on the surface of your coffee. It’s not the worst and you can just keep stirring it in. But when you also add butter, the butter emulsifies all the fats into a lovely homogenous drink. Better: throw it in your Vitamix or blender, and blend until it turns a homogenous caramel colour with a beautiful latté foam on top. I mean, come on! The latté photo below is made without milk – just coconut oil and butter in black coffee. Creamy, right? To be clear, The Bulletproof Executive has a much more refined way of doing this. He uses his own proprietary extremely high quality coffee which is guaranteed free of toxins and mould, and then he also uses his own proprietary MCT (Medium Chain Triglyceride) oil which is slightly more “fat burning” than coconut oil, in that it promotes ketosis more readily. He has really thought this out, and uses it as a “cheat” for intermittent fasting. His theory is that if you limit your solid eating to between the hours of 2pm and 8pm and fast the rest of the time, your body reaps crazy benefits in longevity, energy, metabolism, healing and whatnot. The way he “cheats” is by allowing as much grass-fed butter, MCT oil and coffee as he wants before 2pm. But he would never add milk because that would stimulate digestion and defeat his purpose. And I think he opposes dairy. It is impossible to be hungry if you are downing all your calories directly from tablespoons of pure fat; your caloric requirements are met. (Though all your other dietary requirements are not met – so if you follow his regimen you better be sure to cram nutrient dense foods into your 6 hour eating window). I am intrigued by the intermittent fasting, and think it should probably find its way into my life for one day every week or something. It’s probably not a great regimen if you are trying to get pregnant, already pregnant, nursing etc. (Though eating high fat is a great regimen). Try it. You’ll like it. But if you don’t have grass-fed butter, just use the coconut oil and deal with the oil slick on top. It’s not worth doing this with organic or conventional butter because of all the grain the dairy cows ate. If you just don’t like coffee or you think you should avoid it, you can add grass-fed butter and coconut oil to The Crazy Hot Drink, to unsweetened hot cocoa (preferably raw cacao) or just about any earthy tea – unsweetened chai would be great. Also remember that FAT + SUGAR = sick and fat. If you’re going to embrace fat, and it’s about time you did, you’ve got to kick sugar to the curb. Food Pyramid by Sandrine Love on behalf of Nourishing Our Children. Copyright 2012. All Rights Reserved. In some of my posts you may have noticed that I encourage high-fat eating, and that I discourage consuming grains and sugars. If you want a great primer on this historically proven diet for best health, look no further than this San Francisco website Nourishing Our Children. 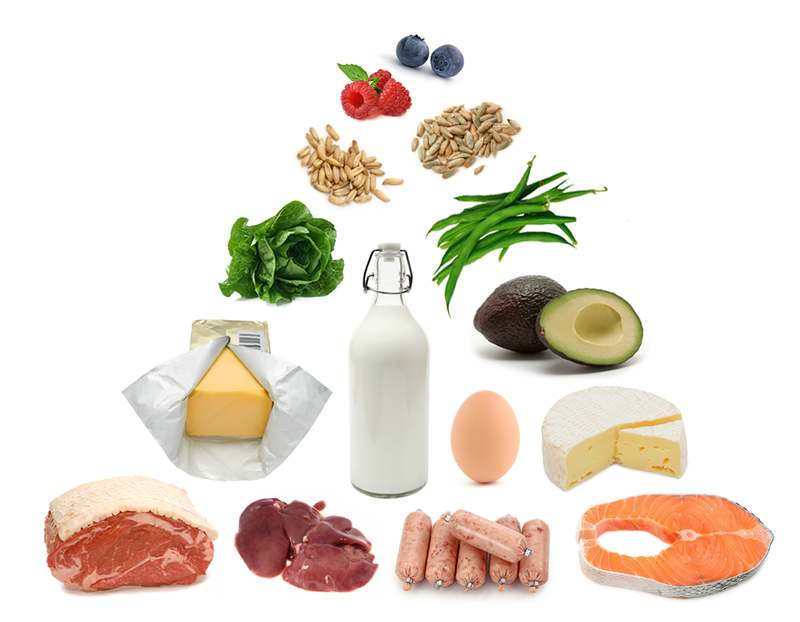 As you can see from the image above (reproduced with permission), they have inverted the traditional food pyramid and put meats and fats at the base instead of the apex – and fruits, grains and vegetables at the apex instead of the base. Whaaaaaat? YES to organic/biodynamic pastured animal products especially the fat and organ meats, eggs and raw dairy. YES to wild-caught salmon and small oily cold-water fish like sardines and mackerel. YES to other good organic fats like coconut oil, olive oil, avocado and soaked nuts (but nuts in moderation). YES to organic fermented full-fat dairy like yoghurt, kefir and raw cheese (without sugar added). YES to spices and herbs, nutrient-dense powerhouses. YES to organic sulfurous vegetables like kale and the dark leafy greens, broccoli, cauliflower, Brussels sprouts, radish, leeks, cabbage, watercress, onions and garlic. YES to other organic vegetables especially low glycemic index choices like lettuces, cucumber, zucchini, green beans, fennel etc. YES to sprouts, the sprouted seeds of lentils, mung beans, chia seeds etc. YES to quinoa, wild rice, chia, buckwheat and flax in moderation. Quinoa and wild rice have to be soaked overnight before preparing, and only consume less than 1/2 cup per day. Way less. YES in moderation: to organic sweet potatoes, carrots and beets – especially if fermented, not pickled. YES to fruits in moderation, but go crazy with organic lemons, and small in-season berries. YES in extreme moderation to healing raw honey and mineral-rich maple syrup. Looks easy enough, let’s see the details. 1. BONE BROTH. This is the number one food you need to be eating that you are not. If you are lazy, start by going to a good butcher and buy their organic broth from the freezer section. In Toronto, I can go to The Healthy Butcher and buy “game broth” made of venison, and also beef and chicken broth.The domestic broths are organic, but not necessarily pasture-raised. If you are less lazy, and ready to take your nutrition to the next level, you can just buy good quality bones (and chicken feet!) and make your own broth at home. Bone broth is full of readily absorbable forms of calcium, magnesium, phosphorus, silicon, sulphur, collagen, trace minerals, the building blocks for glucosamine and chondroitin, and all the amino acids to make your hair and nails strong. Make this broth a staple part of your life, drink it like tea, make soups and stews out of it and let it work its healing magic on your bones, cartilage, connective tissue – basically your whole frigging body. If you want to be even more intense, buy some organic gelatin powder and add it to your warm lemon water, make homemade (low/no sugar) jello and raw milk panna cotta, or just add it into your own broths. 2. GRASS-FED BUTTER. Eat the butter and fat from grass-fed organic cows, preferably Jersey or Guernsey A-2 cows. Put it on all your vegetables, melt it into your mashes, add it to coffee, stir it into anything to make it richer. First of all, grass-fed butter is a great source of Vitamin K2. It is also the best source of Vitamin A, necessary for thyroid and adrenal health; abnormalities of the heart and larger blood vessels occur in babies born to vitamin A deficient mothers (ironically pregnant women are told to limit their vitamin A during pregnancy, because the assumption is that they will try to get it from a synthetic source which causes its own problems – birth defects of the head, heart, brain and spinal column). You can recognize children who eat “low fat” diets devoid of butter because their lack of Vitamin A gives them narrow faces, delicate skeletal features, small palates and crowded teeth. Grass-fed butter is also high in Vitamin D, which helps you absorb calcium and protects against cancers. Butter is a good source of iodine, so you can throw away your iodized table salt (I hope you already did). In addition, butyric acid in grass-fed butter heals the gut; lecithin metabolizes cholesterol; lauric acid heals fungal infections and candida. Just eat it: it won’t make you fat and it won’t lead to heart disease or cancer. It will do the opposite. I bring in Kerrygold butter from the States (pastured Irish butter), or Organic Valley pastured butter from the States (pastured butter only available in the summer and fall) and hoard it in my freezer. There are no retail options in Canada for pastured butter, but it exists if you don’t mind hanging out in a dark alley for a spell. I might just be that witchy, and I use my raw, pastured butter liberally like precious medicine. 3. COCONUT OIL. Use it for all your low and high heat cooking. It has a high smoke point, is shelf stable so will not turn rancid or denature with heat (won’t make itself a trans-fat like most vegetable and seed oils when heated). More importantly, it is the highest natural source of lauric acid aside from breast milk (more than grass-fed butter), which targets and disrupts the fat membranes of invasive fungus, bacterias and yeasts such as Candida albicans, and lipid-coated viruses like herpes, measles, influenza, hepatitus C and HIV. In addition, coconut oil cleanses the digestive system, stimulates the metabolism and reduces appetite. I eat at least 2 TBSP every day; the first one is usually melted into my morning espresso or in The Crazy Hot Drink. Also feel free to enjoy full-fat coconut milk, meat and flour. 4. PASTURED EGGS. These can be hard to come by. Talk to a farmer, make sure the hens are rotated on grass that has been previously occupied by cud-chewing cows so that the hens are eating bugs and worms in addition to grass and feed supplements. In Toronto at Whole Foods and Fiesta Farms I can buy Hope-ECO Farms Small Flock Eggs, a co-op where no chicken farm can have more than 500 chickens – which suggests the hens have a more dignified life and real access to the outdoors (not just “cage-free” designation, which only suggests there is an access door to the outside, not that it is used). Fiesta also just started carrying the Hope-ECO Small Flock duck eggs. 5. OMEGA-3 ESSENTIAL FATTY ACIDS FROM FOOD. Get these from wild-caught salmon (Coho, Chinook if you are Canadian), and other small oily cold-water fish like sardines, mackerel and herring. Also: organ meats, yolks from pastured chickens (but always eat the whole egg), walnuts provided they have been soaked overnight (then dried if you prefer). And let’s not forget the shellfish, which are brimming with vitamins and minerals: crab, oysters, mussels, squid. Omega-3s reduce inflammation in the blood vessels, joints and organs; they reduce risk of heart disease; ease symptoms of rheumatoid arthritis, asthma, ADHD, depression, Alzheimer’s and dementia; they support pregnancy and fetal brain development. Skip the flax seed oil because it is so high in Omega-6 EFAs that they outweigh the benefits. Omega-6s will essentially bind to the same receptors as Omega-3s in the body, so you have to compensate for poor choices high in Omega-6 (industrial meat, industrial grains, industrial oils) with extra high doses of Omega-3 to get back to a preferable ratio. (The body likes to be between 1:1 and 1:5 for Omega-3:Omega-6). Note that I did not say to ingest Omega-3 supplements; there is high likelihood that they are rancid/already oxidized and will cause more bad than good, in the form of inflammation. 6. ORGAN MEATS. I’m talking liver, kidneys, tongue and brains for the more adventurous. You have to get these from a high quality butcher or directly from a trusted farmer because the organ meats of industrially farmed animals are a nightmare – all the toxic antibiotics and accumulation of diseases are fouled up in them. But if you can find your way to a grass-finished cow, then get some of its liver; if you don’t like the taste on its own – then cut it up into small pieces and bury it in a stew or meatloaf. My grandparents always served me “steak & kidney pie” on Sunday nights. You can still buy it at Summerhill Market in Toronto. You can similarly sneak some kidneys into a meatloaf or stew. They look like button mushrooms – but they don’t taste like them!!! Tongue can be purchased as a prepared luncheon meat; it is salty like corned beef hash. Or go ahead and try preparing pickled tongue. Lamb’s brains are the most available brains, who knows why. Nourishing Traditions suggests “baby’s first solids” should be barely warmed lamb’s brains mixed with a slightly runny egg yolk. Or try this brain custard: YUM!? 7. SULFUR. The Bible called it Brimstone. It’s what makes hot springs stink. But it is an essential element that regulates blood sugar, boosts disease resistance, eases aches and pains and detoxes the body. You find it in: egg yolks, broccoli, cauliflower, kale and the other dark leafy vegetables, Brussels sprouts, cabbage, watercress, radish, leek, onion, and of course garlic. 8. PROBIOTIC FOODS. Eat whole fat organic fermented dairy like yoghurt, kefir, and RAW cheeses. Raw cheese is legally available in Ontario at good cheese shops (even Whole Foods has about 20 options). Eat sauerkraut and other fermented vegetable sides and condiments like fermented beet relish and gingered carrots. Take probiotic supplements if you are not eating these things religiously. 9. VEGETABLES, BUT ESPECIALLY LOW GLYCEMIC INDEX VEGETABLES, LOW IN OXALATES. The best choices are lettuces, cucumbers, green beans, celery, bean sprouts, zucchini, asparagus, turnips, rutabagas, peas. Enjoy organic vegetables of different colors, but go easy on the nightshades (tomatoes, peppers, eggplant and definitely no potatoes), and be mindful of the oxalates in Swiss chard, spinach, collard greens, rhubarb (if you boil and discard the water, your calcium absorption won’t be as compromised). 10. SPICES AND HERBS. Cayenne, ginger, turmeric, cinnamon, cloves, pepper, mustard, nutmeg etc. Parsley, cilantro, rosemary, oregano, thyme, chervil, chives, etc. These are powerhouses of nutrients, minerals and medicines. 11. NUTS AND SEEDS. These should be enjoyed in moderation, and not as a staple carbohydrate to replace your breads and pastas. Keep in mind that just like grains – nuts and seeds are high in enzyme inhibitors and toxic protective layers like phytic acid. Their nutrients are locked up inside, and can only be released by soaking and/or sprouting at least overnight. It will vary per nut or seed. You may want to use the soaked product to make a nut or seed milk, or as the base for another substitution recipe or baked good, or you may just want to dehydrate them and store for a snack. Best seeds are: chia, pumpkin, sesame, sunflower and hemp. Best nuts are: walnuts, almonds, pecans, cashews and macadamia nuts. But don’t forget about having a single delicious Brazil nut every day to get your selenium. Also, nuts go rancid really quickly! Most of the commercially salted and honeyed nuts are flavored so that you won’t notice their rancidity. In fact, chances are you might have just grown up with rancid nuts and you don’t notice. What do rancid fats do? Bad things! Like contribute to inflammation, heart disease and cancer! Buy fresh, raw nuts and keep them in the fridge. Soak them, dry or dehydrate them, and then keep them in the fridge some more (though now they are more stable at least). Nuts and seeds are high in Omega-6, so they might add to inflammation if you are eating too much of them or not balancing with adequate Omega-3. 13. FERMENTED COD LIVER OIL SUPPLEMENTS. Take these from a trusted source to provide a perfect balance of Vitamin A, D, EPA, DHA in a whole food form. Combine it with butter oil for a Vitamin K2-A-D trifecta. This is different from taking “fish oil supplements” or even traditional cod liver oil, which I am on the fence about. Fish oils are very unstable, like all the other polyunsaturated oils like canola and flax seed oil. Being unstable means that they oxidize very quickly, which results in rancidity and also free-radical damage and inflammation in the body. To solve this problem, ancient cultures collected the oil from cod livers and then fermented it in barrels; the fermentation of the oil improves it and stabilizes it. But it does nothing for the flavor – ugh! 14. SEA SALT. I cannot emphasize this enough – eat sea salt! It is full of minerals your body is absolutely craving: magnesium, sulfate, calcium, potassium, bicarbonate and varying micro-nutrients depending on what sea bed your salt came from. Adding sea salt to your body restores alkaline/acid balance and improves digestion. Low-salt diets cause way more problems than they prevent, like heart disease and thyroid issues. Having said that, DO NOT DO NOT ingest industrial table salt or industrial products that are full of it. The Mayo Clinic claims all salt is the same and that you shouldn’t eat it. Maybe it’s time to stop listening to the Mayo Clinic. Some people still won’t get enough magnesium just from sea salt, so I recommend soaking in Epsom Salt baths and using a topical Magnesium Oil. 16. FRUIT IN MODERATION. Let’s take it from an apple-a-day to half an apple apple every other day. They are still filled with fabulous pectin which moderates how its sugar is absorbed. Enjoy stone fruits in season, but be mindful of how sweet they are. Go really easy on the tropical sugar bombs: bananas, mangoes, papayas, dates, figs, guava, pineapple etc. I mean, treat them as a very special dessert. And fruit juice has absolutely no role in your life. AVOID THESE COMMODITIES: THEY ARE NOT FOODS! 1. SUGARS. This includes white sugar, brown sugar, corn syrup, HFCS products, agave etc. I will admit that I have a few cheats on hand – raw honey, maple syrup and coconut palm sugar. And when I use those sugars, I try to use half the amount required in a recipe and beef up the other half with stevia leaf powder (I have found that stevia leaf on its own is unsatisfactory, but when combined with honey, maple syrup or coconut sugar – it just augments the natural flavor in an acceptable way.) I tried using Xylitol even though it is a seriously refined industrial product, but it gave me a lot of gas and cramping. No thanks! 2. GRAINS. This includes wheat products like bread and pasta, rice – both brown and white, rye, barley, millet, “gluten-free” products which generally have a higher glycemic index and are higher in sugars, ancient grains like sorghum, spelt, amaranth, einkorn etc. If I’m going to indulge, I give a green light to 1/2 cup soaked and cooked quinoa which at least has all the amino acids so is a complete protein. Go ahead and read Wheat Belly for more information about how grains make us hungrier while at the same time deplete us of nutrients, and then addict us to the cycle. 3. STARCHY VEGETABLES. I’m talking about the American sweethearts: white potato and corn. They just raise your sugar levels too high! Whereas sweet potatoes, beets and carrots are so rich in vitamins that they can be enjoyed in moderation. Especially with grass-fed butter! Or fermented, which eats up a lot of their sugars. 4. BEANS AND LEGUMES. It’s still all about the sugar. Okay, okay, if you really want to soak these overnight (at least) with some ACV or some kombu (seaweed), and then drain off that water and boil the beans/legumes a long time – fine. You can enjoy these in moderation, but not more than 2 cups/week combined. 5. PHYTATES. This is another way of telling you to avoid grains, beans and legumes, which are full of phytates. But so are nuts. And so are some vegetables (spinach, taro, cassava). Phytates bind with essential minerals (iron, zinc, calcium, magnesium) in your food and bloodstream, and can leach minerals from your bones. Almost everyone who eats a lot of grains/beans/legumes is also low in iron (among other things). So if you are going to eat some grains, beans, legumes and nuts – don’t just eat them off the shelf, prepare them properly. Soak them overnight with some kombu (seaweed) and a TBSP or so of some kind of acidic medium like ACV, buttermilk, kefir, whey, yoghurt in a pinch, or some previous soaking water from the same kind of grain/bean/legume/nut if you happened to save it in the fridge. Pour off this phytate water (or save some for your next round of soaking – it is also full of the enzymes that will help break down phytates.) And then prepare your grains/beans/legumes as directed. Believe it or not, oxalate-rich spinach is best boiled, not eaten raw – you’ll sacrifice some water soluble vitamins but not all of them. It’s not the end of the world to get some phytates in your diet, as they have some antioxidant properties and can act like dietary fiber in the colon. But believe me, you’ll get them without even trying. 6. VEGETABLE AND SEED OILS. Basically avoid all modern commercial vegetable and seed oils and their cousins the artificially created trans-fats, like vegetable shortening and margarine. It doesn’t matter if the Heart Association or some other organization has a seal of approval on the package or it claims to be “heart healthy”. It’s not! Can you believe the whole world would lie to you like that? Well it happened. The ratio of Omega 6: Omega 3 in these products can get up to 50: 1, which leads to trouble. As if that weren’t enough, almost all the commercial vegetable oils are GMO and the very worst offenders are canola and soy. Polyunsaturated oils are unstable, which means that they are almost all rancid even as they sit there on the store shelf. Imagine how much more damage they do once you take them home, open up the bottles, and leave them in your cupboard for a few months. Rancid oils are oxidized and full of free radicals which cause inflammation among a million other life damaging effects. But sometimes you just need an oil for cold applications. Stick with single-estate, preferably biodynamic extra virgin olive oil – which does have a myriad of health benefits so long as it is not a cheap, rancid variety conflated with “other oils”. For all other hot applications, stick with coconut oil, grass-fed lard, tallow, ghee or butter. Saturated fats are very safe and stable, and protect your body and brain from the effects of cortisol, estrogen and other problems of aging. 7. MODERN UNFERMENTED SOY PRODUCTS. Full of phytoestrogens – hormone disrupters which cause endocrine damage and can lead to infertility and possibly increase risk of breast cancer in women. The phytates in soy cannot be broken down with soaking, sprouting or heating, so this causes nutrient absorption problems. Almost all soy is now GMO thanks to cross-contamination. So that happened. I’m calling for a big pass on soy milk, soy milk lattées, obviously all packaged food made with soy protein isolate or soya oil. But go ahead and share some boiled edamame with friends from time to time. Sure, try some traditionally prepared tofu or tempeh if you are out at a Japanese restaurant. And definitely try natto if you are crazy enough! Just don’t fall for the “soy=healthy” hype; it’s just a cheap industrial product with a gigantic marketing and lobbying budget. Don’t make modern unfermented soy foods a part of your routine. 8. COMMODITY PROTEINS. The ratio of Omega 6:Omega 3 in industrial beef, pork and chicken, and dairy and eggs is totally overweighted to the Omega 6s thanks to a feedlot diet of acidifying grains and pharmaceuticals. Eating these products will increase your inflammation and lead to disease. Just because your grocery store meat is organic doesn’t mean it isn’t eating a feedlot diet of industrial “organic” grains. You’re going to have to get to know your butcher, or join a meat CSA or get info at a farmer’s market. That’s the only sure way to know you are getting food and not a commodity. 9. FARMED FISH. I remember reading somewhere that farmed Tilapia has a worse nutritional profile than a doughnut. Personally, I’d rather splurge on a doughnut than a toxin-loaded slab of commodity fish. Again, the Omega-6 weighting is completely out of whack and leads to inflammation. I’m going to throw “fish oil supplements” into this category too. Let’s just avoid those as their delicate oils are unstable and become rancid very quickly, leading to the same free radical damage and inflammation that all the other polyunsaturated oils cause. 10. HOMOGENIZED, FAT-REDUCED DAIRY. Homogenization is a mechanical process that changes the shape of the fat molecules in milk – they become smaller and are no longer processed cleanly by the digestive system; instead they directly enter the bloodstream and react against arteries and soft tissues and contribute to heart disease. Industrial milk is pasteurized by law, which denatures the proteins and kills all of the enzymes that would otherwise help you digest it easily. Skim milk is even less of a whole food because it has none of its fat which would help digest all those fat-soluble vitamins milk is famous for (which ironically are just synthetically fortified at this point, and even less digestible). However to keep skim milk from looking green and to give it a creamy mouth-feel, powdered denatured milk protein is added back. All this casein without its fat is toxic to the system. The body recognizes whole foods, but is inflamed and acidified by these industrial conflations. If you can’t access raw dairy or it’s too much of a hassle because of the contrarian laws in your area, choose organic UNHOMOGENIZED WHOLE FAT MILK and dairy. But go easy on it. Failing that, just dilute organic cream or make your own nut milk. But don’t be a jerk. If someone invites you to dinner and lovingly prepares a meal of commodity beef, grains and sugar, just eat it! No one wants to hear about your food beliefs of the week; save it for your blog. Shared meals should be a time of celebration and communion, so don’t ruin them with your politics. Use some sense, people.